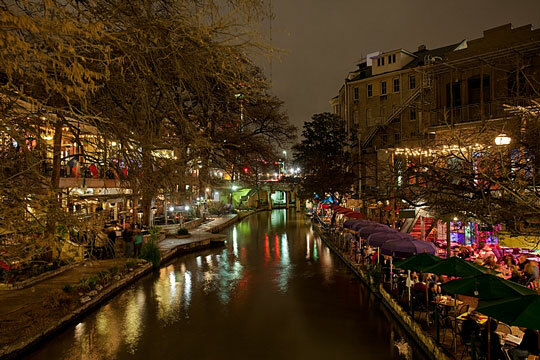 Located in south central Texas and surrounded by gently rolling plains, San Antonio is the third largest city in the state, and the eighth largest city in the U.S. It is also the largest U.S. city with a Hispanic majority and is heavily influenced by Mexico. Five missions built along the San Antonio River serve as the points of origin from which the modern city developed. San Antonio was given its name by the governor of the Spanish Colonial territory on St. Anthony's Day in 1681. A mission was later established on the San Antonio River and a presidio was founded by Spanish soldiers in 1781. Several more missions were built throughout the region and San Antonio became a part of Mexico after the Mexican Revolution of 1821. The Alamo mission, where 198 volunteers held off Mexican leader Antonio Lopez de Santa Anna and his forces for thirteen days in 1836 is one of the city's sources of historical pride. Even though they eventually succumbed, these men inspired Sam Houston's volunteers to defeat the Mexicans a month later and helped Texas win her freedom to become a republic. Many German, Mexican, and Asian settlers began to immigrate to San Antonio, and its population swelled to 8,000 by 1860. Bexar County Government - official Bexar County website. San Antonio Government - official City of San Antonio website. San Antonio Weather and News - current weather in, and recent news about, San Antonio. San Antonio Product and Service Guide - San Antonio enterprises. San Antonio Schools - San Antonio area educational institutions.